Chapter 3 Page 17 is up. Snow-by-Night goes in search of two stones of perfect clarity. Her quest takes her to see a powerful and ancient spirit – one that we’ve met before. 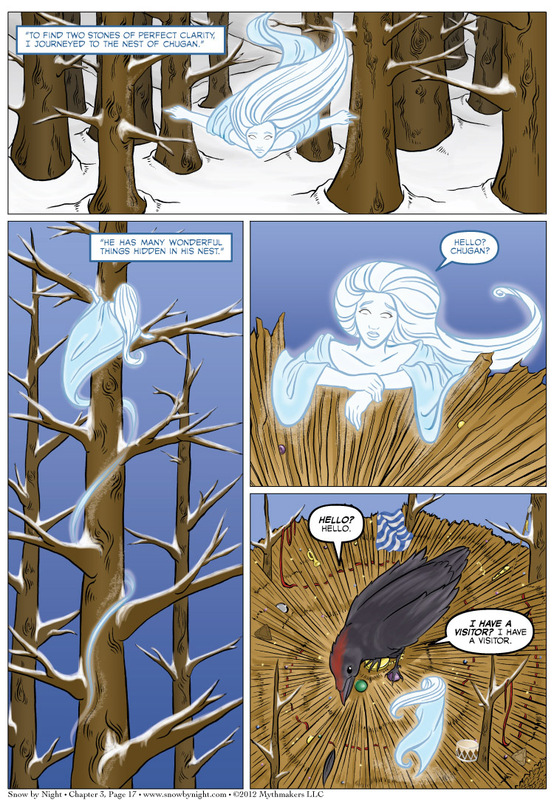 To see a glimpse of Snow-by-Night’s meeting with the ancient spirit, please vote for Snow by Night on Top Web Comics. We’re in the top 50 in the poll. Thank you all so much for your support. Is gonna be one of those tales of “I will give you X if you bring me Y”, and latter “He will give you Y if you bring him Z”? All I can say is “Read and find out.” I’ve got quite a few twists coming in the course of the tale to keep you on your toes. O.O I SAW THE MEDALION!!!!!!!!! Snow-by-night’s heartless design is so cool!